Bruxism is a habitual or unconscious grinding or clenching of the teeth, which usually happens during sleep. Most people suffering from bruxism are not even aware of it. While teeth grinding per se do not pose a major health problem in many cases, bruxism that occurs nocturnally or every night is a sign of sleep disorder and can cause several health issues. How to Tell if You Are Suffering from Bruxism? The most common symptoms associated with bruxism are damaged teeth, headache, back pain, and knee pain. Since many bruxism sufferers are not aware that they have the condition, their parents or bed partners are usually the first to notice it because of sound produced by grinding of the teeth. 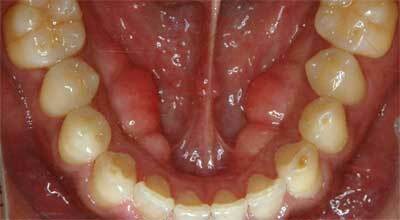 There are cases where bruxism does not produce any sound. This is where many cases of bruxism go unnoticed. It appears though that bruxism can be classified into two types—"teeth grinding" and "teeth clenching". 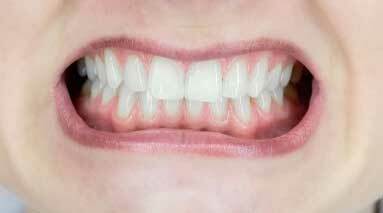 Teeth grinding is a type of bruxism wherein the jaws move while the teeth are held together. This behavior produces sound and can cause wear and tear to the teeth. On the other hand, teeth clenching, as the name implies, is simply the holding of the teeth together while tightening the jaw muscles. It does not make any sound. Although this does not cause so much damage to the teeth, it can result in pain not only along the jaw area but to the other parts of the body as well. Teeth grinding may be referred to as localized bruxism, which means it is a type of bruxism that causes damage around the teeth area. Severe cases can cause tooth pain, tooth fractures, and even deformed bony ridges. You may be able to identify localized bruxism by touching the bony ridges that "bulge" in your mouth with your fingers. See photos below. If left untreated, teeth grinding can result to secondary effects such as "periodontal disease" and "hypersensitivity". Teeth clenching may be referred to as systemic bruxism. It's systemic because people who habitually clench their teeth during sleep feel a sense of fatigue in their jaw, neck, and shoulders, when they wake up. 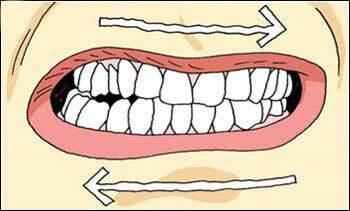 During teeth clenching, the body is exerting muscular forces continuously even during sleep. As a result, various muscle groups of the body will wear out. This will lead to knee pain, back pain, stiff neck and shoulders, and headache. In addition, tight muscles can squeeze and irritate nerves, which can cause vertigo, tinnitus, and loss of vision. Even though clenching of the teeth in particular won't produce any sound or cause wear and tear to the teeth, some people can recognize that one is suffering from systemic bruxism very easily. Look at the photo below. 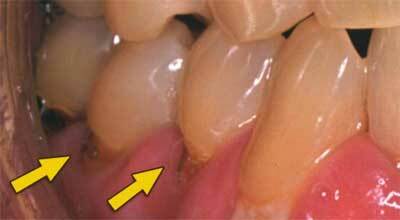 As shown in the photo, severe teeth clenching flexed the tooth due to the strong force that was exerted. This created the wedge-shaped defects. Some studies show that stress is one of the main causes of bruxism, which can mean that it is the way for the body to relieve tension. If you will notice, people who are dealing with a stressful situation usually grind or clench their teeth. In fact, Japanese researchers have discovered that bruxism activates stress-fighting chemicals in the brain. It appears that these natural chemicals can also reduce or neutralize stomach acid, thus, preventing ulcers. Surprisingly, bruxism can also lower blood sugar and blood pressure, too. Mild bruxism may be a good thing for the body, but considering its possible harmful effects, not having bruxism at all is in any case better. How Do You Treat or Prevent Bruxism? 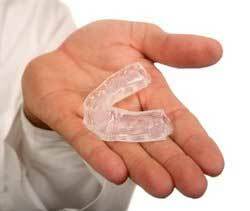 The easiest way to prevent or treat bruxism is through the use of mouthpiece or dental guards. It can help disperse the excessive force applied to the teeth. 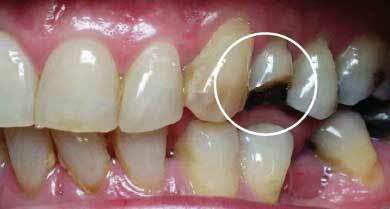 Damaged teeth may be repaired by using prosthetic crowns. We recommend visiting your dentist for other possible alternatives.